Brownells Front Cut RMR Slides for Glock® pistols feature a distinctive, wraparound serration pattern that aids in manipulating the slide, especially when checking the chamber. (OK, we’ll admit it: the serrations look cool, too.) They also come with a pre-cut slot for easy, secure, low-profile mounting of a Trijicon RMR sight. All slides equipped with standard Glock sight cuts for front and rear sights of your choice. If the RMR is in place, suppressor height sights are required. In addition, you can get your Front Cut RMR Slide with an optional "window" cutout on top between the front serrations that reduces weight and enhances airflow to keep the barrel cooler - ideal for hard-working action competition pistols. Each Front Cut RMR Slide starts life as a billet of 17-4 stainless steel that is machined to Glock® factory specifications inside, so it’ll fit factory frames and accept factory or aftermarket barrels and parts. Fits Gen3 Glock® 17 and 19 pistols & components Available with distinctive top window cutout or traditional solid top Machined from corrosion-resistant 17-4 stainless steel billet Heat Treated to 41-44 on the Rockwell C scale Given a wear-resistant matte black Nitride finish Pre-cut Trijicon RMR mounting slot, plus factory front/rear sight cuts A Brownells Front Cut RMR Slide is the ideal upgrade for your factory Glock 17 or 19 pistol - and the perfect top half for a new custom gun built on an 80% frame. You can get your RMR slide in one of three finishes: there's a wear-resistant basic Black Nitride finish, as well as a thin, extremely tough, good-looking Bronze or Flat Dark Earth (FDE) physical vapor deposition (PVD) coating. Channel liner required for these slides. Channel liners are a press fit and require a tool to install. Brownells Front Cut RMR diapositive per pistole Glock® dispongono di un modello di dentellatura distintivo, avvolgente che aiuta a manipolare la diapositiva, soprattutto quando il controllo della camera. (OK, noi ammettere che: le dentellature look fresche, troppo.) Sono inoltre dotate di uno slot pre-tagliato per il montaggio facile, sicuro e a basso profilo di uno spettacolo di Trijicon RMR. Tutte le diapositive dotate di tagli di vista standard Glock per anteriore e posteriore attrazioni di vostra scelta. Se la RMR è a posto, soppressore altezza attrazioni sono richiesti. Inoltre, è possibile ottenere tuo Front Cut RMR Slide con un ritaglio di opzionale "finestra" sulla parte superiore tra le dentellature anteriore che riduce il peso e migliora il flusso d'aria per mantenere la canna più fredda - ideale per pistole concorrenza azione di duro lavoro. Ogni Front Cut RMR Slide inizia la vita come una billetta in acciaio inox 17-4 lavorato secondo le specifiche della fabbrica Glock® all'interno, quindi potrai applicare fabbrica telai e accettare parti e botti di fabbrica o aftermarket. ® Si adatta Gen3 Glock 17 e 19 pistole & componenti disponibili con finestra superiore distintivo ritaglio o tradizionali lavorati top solido ricavata dal pieno in acciaio inox resistente alla corrosione 17-4 trattati termicamente a 41-44 della scala Rockwell C dato un nero opaco resistente all'usura Nitruro di finire slot di montaggio pre-tagliati Trijicon RMR, più tagli di vista anteriore/posteriore di fabbrica A Brownells Front Cut RMR Slide è l'aggiornamento ideale per la tua fabbrica Glock 17 o 19 pistola - e la metà superiore perfetta per una nuova pistola personalizzata costruita su un telaio di 80%. È possibile ottenere la diapositiva RMR in una delle tre finiture: c'è un rivestimento di nitruro nero base resistente all'usura, come pure un sottile, estremamente resistente, attraente bronzo o Flat Dark Earth (FDE) physical vapour deposition (PVD) rivestimento. Fodera di canale richiesto per queste diapositive. Fodere di canale sono una stampa adatta e richiede uno strumento per installare. Good value. OEM internals and barrel all fit just fine. Went on my Polymer80 build perfectly. Only issue is the non-standard thread pitch for the RMR mount. Every single other slide I know of uses 6-32 pitch screws for the RMR, including the factory Trijicon screws. For whatever reason, this slide uses 4-40 and, as of 9/28/17, Brownells doesn't have any extra to provide, just in case you like having a few on hand just in case as I do. However, the slide is supposed to come with two of the proper sized screws to assist you in mounting your RMR. All in all, I'd buy this again even knowing about the odd sized screws. I converted my Glock 23 into a Glock 19. I considered the barrel conversion but the breach face is different on a 23 slide then it is on a 19. So I wanted to do a full 9mm upper. I chose Brownellâs Slide because (1) it was on sale (2) it was supposedly Glock specks (3) the RMR cut was supposedly low profile as to be able to use regular iron sights (Brownellâs later changed on the website that you needed Suppressor Sight, but whatever). I built my upper. All the Glock internals fit just fine, including the channel Liner (used channel liner tool). It shot very well. The RMR did sit very low. I was able to use regular iron sights to co-witness. I was very happy with the slide. The only thing I didnât like was itâs too boxy. Wish they could have beveled the front and maybe have a more aggressive Chaffer cut (I might get it sent out for slide work). Other than that, it was a good product that was sold at a good price. I bought this slide in November 2017. Too good of a value to pass up with all the Black Friday discounts. Literally half price of any other âbuild-it-yourselfâ slides out there at the time, and with the features I wanted. When it arrived, I was pleased to see that Brownellâs had addressed some of the âblockyâ criticisms by increasing the depth of the 45-degree chamfor on the top edge. The new top radius is more comparable to the Glock OEM profile (just angular), and matches other offerings out there by the big name Glock custom manufacturers. The one down-side: Brownells RMR cut is deeper/lower than anyone else. The top profile matches most everyoneâs RMR angular cover plate out there, but everyoneâs RMR cover plate sits too low, and none are flush with the slideâs top profile. So if youâre not putting an RMR on it right away (which Iâm not), you get to choose between and odd-looking profile with a top plate sitting too low, or no plate at all and an open cut. Neither of these is very appealing, and has impacted my enjoyment of my new project. Brownellâs needs to immediately offer their own matching top plate for (or included with) the slide ($30-40 value), include (even a plastic) spacer so itâll work with anyone elseâs top cover, or change the depth of their cut bringing it in line with everyone else (and replace my slide if you do!). If this happens, this becomes a five-star product rivaling anyone elseâs slide out there. Ordered this slide for a Polymer 80 Glock 19 build. Packaging for item was nothing special a bag with a little foam pad wrapped around. The slide itself has good weight and seems nicely machined, but upon further inspection I was left disappointed. The slide had a few issues with it starting with the uneven nitride spotting or chips. Slide also had some internal wear near muzzle slightly odd since itâs brand new. The slide had a chip on the rear corner of the slide. Finally the deal killer for me was that my particular slide had a sizeable burr on the rear serration. A burr on a piece of the slide I will frequently touch with my hands is completely unacceptable. Iâve read and heard Brownellâs makes nice gun parts, but this slide leaves much to be desired. I have a Brownellâs/ Victory First Glock 19 Barrel on backorder that I am considering canceling due to my experience with this item. I have contacted Brownellâs and I will see what they suggest. Overall nice slide, but my example has some issues that I canât live with considering the $200 price tag. Short and sweet, I was very impressed with this slide for the money. Channel liner was a bit tight but went in with a bit of pressure - I use an old style bic pen as an install tool, works great. Co-witness is better than my MOS 19. Ran 300 rounds thru it today, no issues. Fit and finish were perfect. Parts kit installed without issue. An amazing value at half the cost of any other RMR cut slide. Overall Iâm very satisfied with it and I highly recommend it. I bought this, to go along with a stripped frame, barrel and parts kits I already had because I wanted to assemble a Glock from scratch for the first time. With only one minor mishap with a slide lock spring that may still be orbiting in space (I had a spare), it all went together quickly and easily. I installed the rmr (rm01) and took it to the range & was very pleasantly surprised; my shooting has never been this accurate. I am now a firm believer in red dots on pistols. My eyes haven't been able to focus on the front sight without reading glasses for years and this rmr cut slide, along with the rmr of course, solved that problem. I used this for my Glock 17 build in 9mm. I was impressed with how well the slide looks and works. It is very blocky though there are lots of square angles. So it looks weird compared to a traditional slide. But overall I am happy with the fit and finish of the slide. 1. The slide wasn't cut all the way through for the extractor (see picture). 2. The whole for the firing pin channel line is too small. It looks like the firing pin channel might have been drilled to be used without the lining. As such it's going back for replacement. Hopefully the replacement is going to be better. Great value for this slide, especially when it is on sale. I did not have any issues assembling it or attaching my RMR, however when I first assembled the entire Glock I had a series of failure to extract and feed problems. The bottom of the slide that rides on the trigger bar was just a little too thick so it was causing too much friction for the slide to successfully extract. This was solved very easily with a little lubrication and alot of racking the slide back and forth to wear it in until it finally worked. Have not had an issue since. The sights I used were XS suppressor height big dot sights with the RMR, not TRUGLO, as stated. The slide Brownells shipped me first was for a Glock 19, although the bag said Glock 17. Called Brownells and they said a few of this items were misbagged, but that the issue is fixed. They immediately sent me the correct slide before I even returned the wrong one. That's solid customer service this return was simple (and free) with Edge. The slide is a good price, especially on sale, and cut exactly how I wanted to cut a slide, but at about the same price as a slide blank from Lone Wolf, it saved me man hours of machining and refinishing. The nitride finish seems well done, and the machining is pretty good for a lower priced slide. Lone Wolf slide completion kit, Lone Wolf recoil kit, Swenson threaded barrel, an RMR, and TRUGLO suppressor height sights all fit and operate well on a FS Glock frame. Had one minor fitting issue with the channel liner. I wrecked one putting it in due to a very tight firing pin channel. I used Edge free shipping to order a few extra since I was low on stock on the liners. Rolling a liner over some sandpaper got it to fit in snugly without breaking. If you haven't put a channel liner in a Glock slide, I recommend getting a few extras and buying a tool to install the liner. It makes it a little easier. This slide is good for the money. 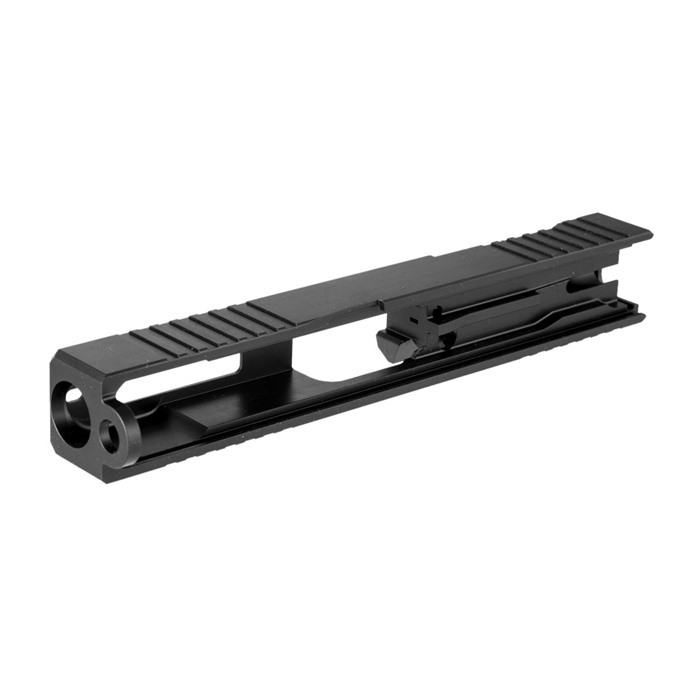 It is to spec, the RMR mounts very nicely on top, and unlike most other slides, the threads for rmr stick up, which should take pressure off of the screws and help maintain a better zero and be less hard on the optic you mount. I don't think it is the most attractive slide, with the bulky vertical cuts. I think more thin, angled serrations are both more attractive, and feel better to grab (as seen on sigs and springfield XD's). This will not affect my review though, as I received what I was paid for. Also, the edges on the serrations are a little.. serrated. Sharp at least, when compared to the factory glock slide. Overall, for the money, quality, and function, I WOULD give the slide 5 stars. However, the screws for this slide are proprietary, and my slide didn't come with any screws, which Brownells promptly corrected by shipping them to me when I called. Between the sharpish serrations, proprietary screws, and forgetting to include said screws, one star will be taken from gryffindor. Used this for a Poly80 v2 build. 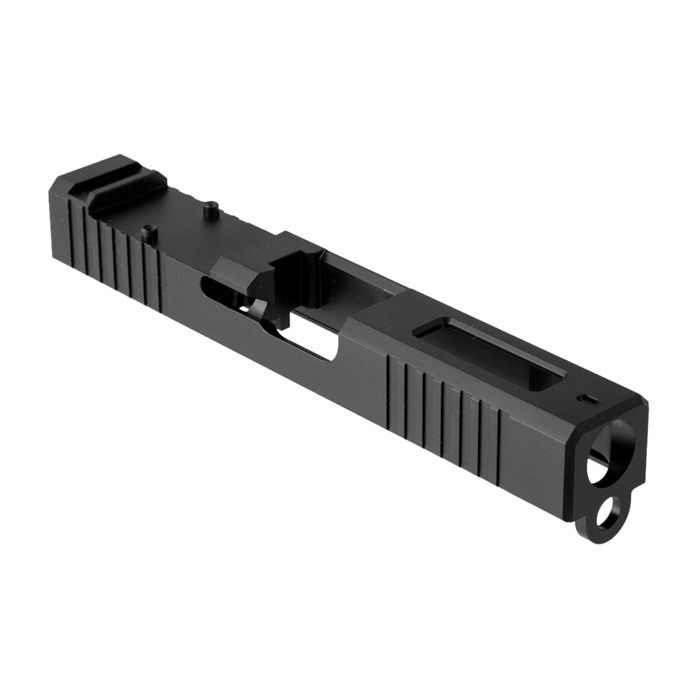 The rails are a few hundreds of an inch narrower than my G17 and G17L slides, so there is less lateral play when this slide is placed on the factory G17 and G17L frames. When using this slide with the Poly 80, you may have to stone the sides of either the front or rear rails slightly to get this slide to even fit onto the rails. Make sure you get a nice stone for this job. Function with factory G17, factory G17L, Swenson, and Silencerco threaded barrels is perfect. This does require a tool to set the striker liner. Don't skimp and try to set the liner without the correct tool. You will mess up the liner! I had absolutely no issues installing this part. It works perfectly with my LoneWolf AlphaWolf barrel, LoneWolf stainless extractor and internals. I read where people were having issues with the striker channel liner install so I buffed my striker channel with 1500 grit wet sandpaper, especially around the tapered end (that's supposed to go in first). With the proper tool, it installed easily and the slide functioned flawlessly out of the box. The XS sights were a great fit all the tolerances seem to be in spec.The machining and nitrite finish look perfect, very clean. This is such a great piece, especially for the price. Put my stock 17 parts and barrel in it and fired about 50 rounds of reloads without a problem. The machining is very nice. I left the 5 star reveiw above before I installed the Chanel liner. I believe it was under sized. I ruined my first liner trying to press it in and I had to sand down the 2nd one to make it fit. But I'm still happy with it overal. I recently bought this slide and the Brownell's slide completion kit. All parts, including the striker channel sleeve, fit the slide great and I've had perfect function on my Gen 3 Glock 17 frame. My buddy has this slide also and he has no complaints. Great machining and slide finish. Thanks Brownells for providing this RMR slide with such a good price and quality. It worked flawless for me. Even the channel liner went in without using a channel liner tool and a puncher. According to a Glock Tech who I talked to, the channel liner should be easily pushed in with fingers first and then by the firing pin spacer. He did exactly that for mine. Before this, I looked at ZEV's slides. Those are way too expensive in my mind. I do not know how people can justify that. I do not think anyone should spend that much for a slide. This one is perfect. As another gent mentioned, I destroyed the channel liner trying to press it in. Fits fine about 2/3 of the way then stops solid. Almost looks like there is a liner in there already, but it looks silver or white. I guess Iâll order another channel liner and try what previous reviewer mentioned. The slide finish is perfect. My only complaint is that it was shipped in a bag that wasn't well padded - but the slide arrived unscathed. Others might not be so lucky - I would expect that this be boxed and shipped. Anyway, standard Glock parts fit perfectly EXCEPT the CHANNEL LINER. First - THERE IS NO CHANNEL LINER INSTALLED! Despite what YouTube guys say - you need to install one. I had a lot of difficulty with the channel liner and destroyed 2 of them trying to put it in with the Channel Liner too. The hole in the slide is slightly too tight and you cannot pound a channel liner in without deforming it. You need to sand the outside of the channel liner a little to get it to hand fit in and then push it in with the channel liner tool. If you do not, there is no way the channel liner will fit. Other than that, the slide is a great value and I can't understand why others are charging $300 - $700 for the same thing. Yeah, others might have more fancy cutting but it's a matter of a few machine minutes and not hundreds of hours. I am so happy with this one that I'm going to build another for a Glock 19 (Polymer 80). The style of this slide fits the Polymer80 design very well! Based on the spotty reviews stemming from poor quality assurance, I wasn't quite sure what to expect, but I purchased this slide and hoped for the best. Let me say, I am glad that I made the leap because I am extremely impressed with this slide. In all fairness, I don't have experience with other aftermarket Glock slides, so I can only speak to Brownell's. Fit and function appear to be perfect. The nitride finish is beautiful, not a single defect. The RMR fits snug inside of the cut. I looked hard and cannot find a single machining mark on this part. I saw other reviewers complaining about defects, machining marks, etc. so perhaps there was bad batch, it happens, but that has not been my experience. Mapleleaf Tactical out of Texas makes a Brownell's RMR Cut Slide Cover. They have a good selection of different materials and finishes (brass, aluminum, cerakote, etc.) and they sell for $30 to $42 shipped. I ordered one but it hasn't arrive yet. If I remember, I'll update images showing the cover installed. Just a side note, I cannot stand when people knock off stars because they had to fit the friggin' channel liner. Not only is it irritating to us that are proficient with guns, but it is misleading to potential buyers who don't know any better...rarely is any gun part plug-n-play, especially with pistols. If you want a gun where you don't have to worry about fitment, then buy a production model gun or an AR15. I gave this piece three stars, if I could I would give it 3.5 stars. Here are my reasons. First, while installing a factory Glock (white in color) channel liner it was destroyed. I purchased the channel liner here at Brownell's and assume it was a factory part. It seemed rather flimsy. I used a Brownell's channel liner tool on the second one, after cleaning the hole out thoroughly with alcohol on a swab. In hindsight I should have looked closer and cleaned the hole out where the channel liner fits the first time. The second channel liner was black (also purchased through Brownell's )and I am not sure if it was a factory Glock part. It had burrs on it so I cleaned them off, and then it slid right in. The channel liner was an inconvenience, I probably should have cleaned it out the first time I tried it. The real issue is the RMR mount. The supplied screws are too short to properly retain the RMR properly. They need to be about 3mm longer to hold the RMR. Using the supplied screws only 1-2 threads are holding the RMR down, I wouldn't trust it. So now I have to source some longer screws. Apparently I am not the only one with this issue as I saw a question asked about the screw dimensions so they could also buy the correct screw. It is a 4x40 tpi T10 drive countersunk flathead .237" long. Other than the RMR screws it is a very nice slide! The fit and finish are nice, it fit well and the price was good. The coating looks very nice and durable. I wish they would include the cover for the RMR slot or at least offer one. I would definitely purchase another slide, I have already recommended this specific slide to a friend of mine. His looked identical to mine and I assume it will function just as well! I bought a set of Trijicon Suppressor Height sights to use with the RMR but because the RMR sits so low in the cut out, half the window is blocked by the sights. Yes, low is good, but be aware there is a down side. I asked Brownells if they have adapter plates available and the answer is "No". Also, a recent article I read tells of issues with fit of Glock brand parts, as those parts vary. The writer tried three different extractors and only one fit. Just a caution. Mine all fit fine and functioned perfectly. And yes, the channel lined went in OK, but I did use the specific tool and followed correct instructions. After reading previous reviews, I decided to lube the channel first though--just in case. I used a coupon and got it for $210 shipped. Shipping was fast and it was packed nicely. Great slide works well on P80, takes some time to break in. Great price for a great slide. This is the first part that I have purchased for my build and after looking it over it looks extremely well made. No tooling marks, unfinished areas, or burrs. I will update if anything changes after I buy the rest of the pieces but so far so good. I bought one of these for a G19 build I am doing, and I could not be happier. I love the look of the slide, it is super light which is nice. I can't wait for Brownells to get their cover plate to market for when I don't have the RMR on the pistol. Love this, I highly recommend all of the Brownells brand slides! Awesome slide for the price! Highly recommend, used this to complete my P80 build. Only thing I wish was available from brownells is a cover plate for the rmr cutout, in case people are gonna use iron sights for awhile. Iâm using this for my polymer 80 build. Slide looked great. No imperfections that I could see anywhere on it. Amazing price especially compared to other aftermarket slides. Only small issue I have is it doesnât fit any of my holsters. Other than that I couldnât be happier with the slide. Channel liner difficult to install even with a channel liner tool. I broke two when trying to install with little effort. Incredibly frustrating. The description clearly states a channel liner needs to be installed. A channel liner installation tool makes the task exceptionally easy. After assembling all the other slide parts and installing them along with the Trijicon RMR sight, for which this slide is specifically milled (not other red dot or holo sights) a good lube with grease helps to shoot the slide in. The slide fits a G19 and I gather the 80% ones as well. I encountered no difficulties with any portion of assembly, installation or use of this slide. Customers need to read what is being purchased, it's use and have knowledge of what is needed and what tools and talents are required to make their experience 5 star instead of blaming the product for a lack of knowledge and/or skill. Donât even know where to start! Iâve built around 15 ARâs but was getting bored with it and decided to tackle my first pistol build. Decided on the Polymer80 Glock 19, did quite a bit of research on parts. The Brownells slide seemed like the best combo of affordability and options so I ordered it. When it got here and I opened the plastic bag the first thing I see is surface rust in the extractor area ( cleaned up pretty easy, the second was the discoloration on the slide..not so easy! Tried the old AR trick of rubbing oil into the finish, that did not change a thing! Canât believe the place that manufactured this part would even let it leave their facility. Iâve bought a lot of Brownells branded AR parts ( Barrels, Bolt carriers etc.) and they all looked great. This, not so much! The only way I can see fixing the finish would be to get it Cerakoted which will add to price and completion time! Nicely machined; All Glock parts fit well; Channel liner was very easy to install. A great value at a reasonable price! Great product great price, Brownells service is impeccable. I had an issue with the original purchase, once I arranged a return and sent it to the post office. I called and was surprised at the speed and ease my problem was repaired. I had a new part faster than expected. Brownells is great. I recommend this slide as well. Mine came with the channel liner. Good price but itâs a rough slide. My channel liner went in hard and the rmr cut and rear site dovetail needed some fitting. Iâm blaming the slide instead of the parts because they fit well in other slides but were too tight to fit onto the slide without some serious filing. It really took the joy out of this for me. For the amount of time Iâd rather pay for a higher quality slide. Not a bad slide but it does feel chunky and blocky. It does not feel as finished as other slides. RMR Slide +Window Gen3 Glock® 19 Stainless Nitride 050806112681 Brownells Front Cut RMR diapositive per pistole Glock® dispongono di un modello di dentellatura distintivo, avvolgente che aiuta a manipolare la diapositiva, soprattutto quando il controllo della camera. (OK, noi ammettere che: le dentellature look fresche, troppo.) Sono inoltre dotate di uno slot pre-tagliato per il montaggio facile, sicuro e a basso profilo di uno spettacolo di Trijicon RMR. Tutte le diapositive dotate di tagli di vista standard Glock per anteriore e posteriore attrazioni di vostra scelta. Se la RMR è a posto, soppressore altezza attrazioni sono richiesti. Inoltre, è possibile ottenere tuo Front Cut RMR Slide con un ritaglio di opzionale "finestra" sulla parte superiore tra le dentellature anteriore che riduce il peso e migliora il flusso d'aria per mantenere la canna più fredda - ideale per pistole concorrenza azione di duro lavoro. Ogni Front Cut RMR Slide inizia la vita come una billetta in acciaio inox 17-4 lavorato secondo le specifiche della fabbrica Glock® all'interno, quindi potrai applicare fabbrica telai e accettare parti e botti di fabbrica o aftermarket. ® Si adatta Gen3 Glock 17 e 19 pistole & componenti disponibili con finestra superiore distintivo ritaglio o tradizionali lavorati top solido ricavata dal pieno in acciaio inox resistente alla corrosione 17-4 trattati termicamente a 41-44 della scala Rockwell C dato un nero opaco resistente all'usura Nitruro di finire slot di montaggio pre-tagliati Trijicon RMR, più tagli di vista anteriore/posteriore di fabbrica A Brownells Front Cut RMR Slide è l'aggiornamento ideale per la tua fabbrica Glock 17 o 19 pistola - e la metà superiore perfetta per una nuova pistola personalizzata costruita su un telaio di 80%. Fodera di canale richiesto per queste diapositive. Fodere di canale sono una stampa adatta e richiede uno strumento per installare. 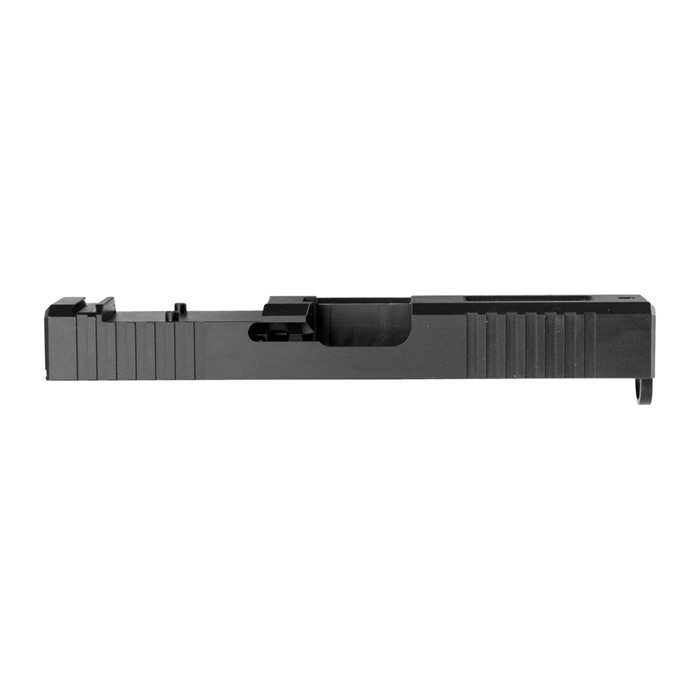 Brownells Front Cut RMR diapositive per pistole Glock® dispongono di un modello di dentellatura distintivo, avvolgente che aiuta a manipolare la diapositiva, soprattutto quando il controllo della camera. (OK, noi ammettere che: le dentellature look fresche, troppo.) Sono inoltre dotate di uno slot pre-tagliato per il montaggio facile, sicuro e a basso profilo di uno spettacolo di Trijicon RMR. Tutte le diapositive dotate di tagli di vista standard Glock per anteriore e posteriore attrazioni di vostra scelta. Se la RMR è a posto, soppressore altezza attrazioni sono richiesti. Inoltre, è possibile ottenere tuo Front Cut RMR Slide con un ritaglio di opzionale "finestra" sulla parte superiore tra le dentellature anteriore che riduce il peso e migliora il flusso d'aria per mantenere la canna più fredda - ideale per pistole concorrenza azione di duro lavoro. Ogni Front Cut RMR Slide inizia la vita come una billetta in acciaio inox 17-4 lavorato secondo le specifiche della fabbrica Glock® all'interno, quindi potrai applicare fabbrica telai e accettare parti e botti di fabbrica o aftermarket. ® Si adatta Gen3 Glock 17 e 19 pistole & componenti disponibili con finestra superiore distintivo ritaglio o tradizionali lavorati top solido ricavata dal pieno in acciaio inox resistente alla corrosione 17-4 trattati termicamente a 41-44 della scala Rockwell C dato un nero opaco resistente all'usura Nitruro di finire slot di montaggio pre-tagliati Trijicon RMR, più tagli di vista anteriore/posteriore di fabbrica A Brownells Front Cut RMR Slide è l'aggiornamento ideale per la tua fabbrica Glock 17 o 19 pistola - e la metà superiore perfetta per una nuova pistola personalizzata costruita su un telaio di 80%. Fodera di canale richiesto per queste diapositive. Fodere di canale sono una stampa adatta e richiede uno strumento per installare. 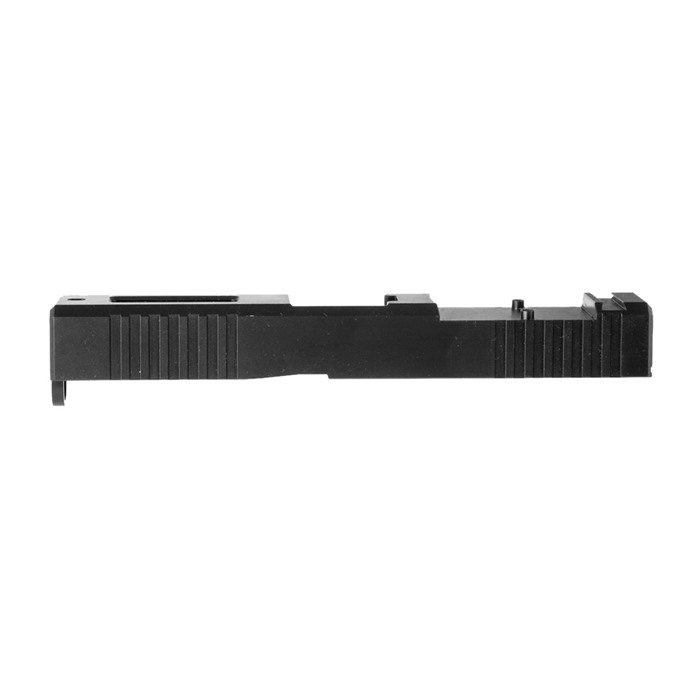 RMR Slide for Gen3 Glock® 17 Stainless Nitride 050806112650 Brownells Front Cut RMR diapositive per pistole Glock® dispongono di un modello di dentellatura distintivo, avvolgente che aiuta a manipolare la diapositiva, soprattutto quando il controllo della camera. (OK, noi ammettere che: le dentellature look fresche, troppo.) Sono inoltre dotate di uno slot pre-tagliato per il montaggio facile, sicuro e a basso profilo di uno spettacolo di Trijicon RMR. Tutte le diapositive dotate di tagli di vista standard Glock per anteriore e posteriore attrazioni di vostra scelta. Se la RMR è a posto, soppressore altezza attrazioni sono richiesti. Inoltre, è possibile ottenere tuo Front Cut RMR Slide con un ritaglio di opzionale "finestra" sulla parte superiore tra le dentellature anteriore che riduce il peso e migliora il flusso d'aria per mantenere la canna più fredda - ideale per pistole concorrenza azione di duro lavoro. Ogni Front Cut RMR Slide inizia la vita come una billetta in acciaio inox 17-4 lavorato secondo le specifiche della fabbrica Glock® all'interno, quindi potrai applicare fabbrica telai e accettare parti e botti di fabbrica o aftermarket. ® Si adatta Gen3 Glock 17 e 19 pistole & componenti disponibili con finestra superiore distintivo ritaglio o tradizionali lavorati top solido ricavata dal pieno in acciaio inox resistente alla corrosione 17-4 trattati termicamente a 41-44 della scala Rockwell C dato un nero opaco resistente all'usura Nitruro di finire slot di montaggio pre-tagliati Trijicon RMR, più tagli di vista anteriore/posteriore di fabbrica A Brownells Front Cut RMR Slide è l'aggiornamento ideale per la tua fabbrica Glock 17 o 19 pistola - e la metà superiore perfetta per una nuova pistola personalizzata costruita su un telaio di 80%. È possibile ottenere la diapositiva RMR in una delle tre finiture: c'è un rivestimento di nitruro nero base resistente all'usura, come pure un sottile, estremamente resistente, attraente bronzo o Flat Dark Earth (FDE) physical vapour deposition (PVD) rivestimento. Fodera di canale richiesto per queste diapositive. Fodere di canale sono una stampa adatta e richiede uno strumento per installare. RMR Slide +Window Gen3 Glock® 17 Stainless Nitride 050806112674 Brownells Front Cut RMR diapositive per pistole Glock® dispongono di un modello di dentellatura distintivo, avvolgente che aiuta a manipolare la diapositiva, soprattutto quando il controllo della camera. (OK, noi ammettere che: le dentellature look fresche, troppo.) Sono inoltre dotate di uno slot pre-tagliato per il montaggio facile, sicuro e a basso profilo di uno spettacolo di Trijicon RMR. Tutte le diapositive dotate di tagli di vista standard Glock per anteriore e posteriore attrazioni di vostra scelta. Se la RMR è a posto, soppressore altezza attrazioni sono richiesti. Inoltre, è possibile ottenere tuo Front Cut RMR Slide con un ritaglio di opzionale "finestra" sulla parte superiore tra le dentellature anteriore che riduce il peso e migliora il flusso d'aria per mantenere la canna più fredda - ideale per pistole concorrenza azione di duro lavoro. Ogni Front Cut RMR Slide inizia la vita come una billetta in acciaio inox 17-4 lavorato secondo le specifiche della fabbrica Glock® all'interno, quindi potrai applicare fabbrica telai e accettare parti e botti di fabbrica o aftermarket. ® Si adatta Gen3 Glock 17 e 19 pistole & componenti disponibili con finestra superiore distintivo ritaglio o tradizionali lavorati top solido ricavata dal pieno in acciaio inox resistente alla corrosione 17-4 trattati termicamente a 41-44 della scala Rockwell C dato un nero opaco resistente all'usura Nitruro di finire slot di montaggio pre-tagliati Trijicon RMR, più tagli di vista anteriore/posteriore di fabbrica A Brownells Front Cut RMR Slide è l'aggiornamento ideale per la tua fabbrica Glock 17 o 19 pistola - e la metà superiore perfetta per una nuova pistola personalizzata costruita su un telaio di 80%. È possibile ottenere la diapositiva RMR in una delle tre finiture: c'è un rivestimento di nitruro nero base resistente all'usura, come pure un sottile, estremamente resistente, attraente bronzo o Flat Dark Earth (FDE) physical vapour deposition (PVD) rivestimento. Fodera di canale richiesto per queste diapositive. Fodere di canale sono una stampa adatta e richiede uno strumento per installare. RMR Slide for Gen3 Glock® 19 Stainless Nitride 050806112667 Brownells Front Cut RMR diapositive per pistole Glock® dispongono di un modello di dentellatura distintivo, avvolgente che aiuta a manipolare la diapositiva, soprattutto quando il controllo della camera. (OK, noi ammettere che: le dentellature look fresche, troppo.) Sono inoltre dotate di uno slot pre-tagliato per il montaggio facile, sicuro e a basso profilo di uno spettacolo di Trijicon RMR. Tutte le diapositive dotate di tagli di vista standard Glock per anteriore e posteriore attrazioni di vostra scelta. Se la RMR è a posto, soppressore altezza attrazioni sono richiesti. Inoltre, è possibile ottenere tuo Front Cut RMR Slide con un ritaglio di opzionale "finestra" sulla parte superiore tra le dentellature anteriore che riduce il peso e migliora il flusso d'aria per mantenere la canna più fredda - ideale per pistole concorrenza azione di duro lavoro. Ogni Front Cut RMR Slide inizia la vita come una billetta in acciaio inox 17-4 lavorato secondo le specifiche della fabbrica Glock® all'interno, quindi potrai applicare fabbrica telai e accettare parti e botti di fabbrica o aftermarket. 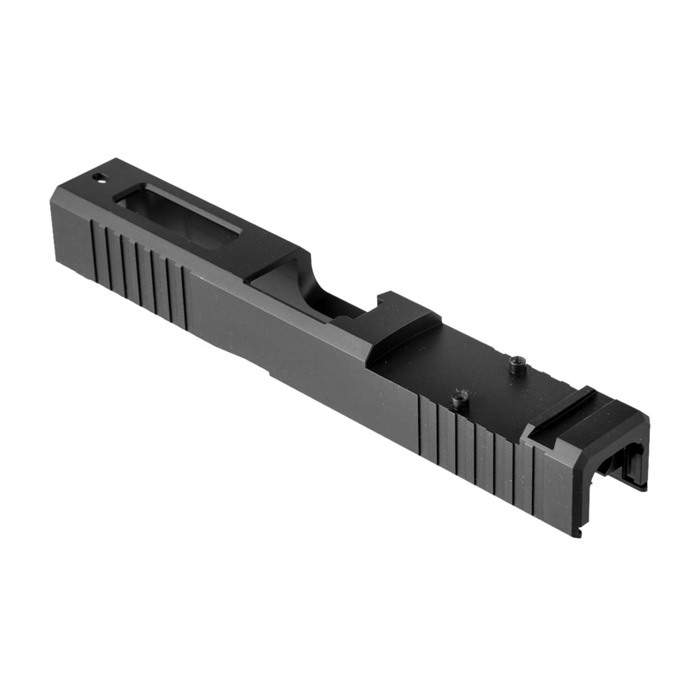 ® Si adatta Gen3 Glock 17 e 19 pistole & componenti disponibili con finestra superiore distintivo ritaglio o tradizionali lavorati top solido ricavata dal pieno in acciaio inox resistente alla corrosione 17-4 trattati termicamente a 41-44 della scala Rockwell C dato un nero opaco resistente all'usura Nitruro di finire slot di montaggio pre-tagliati Trijicon RMR, più tagli di vista anteriore/posteriore di fabbrica A Brownells Front Cut RMR Slide è l'aggiornamento ideale per la tua fabbrica Glock 17 o 19 pistola - e la metà superiore perfetta per una nuova pistola personalizzata costruita su un telaio di 80%. È possibile ottenere la diapositiva RMR in una delle tre finiture: c'è un rivestimento di nitruro nero base resistente all'usura, come pure un sottile, estremamente resistente, attraente bronzo o Flat Dark Earth (FDE) physical vapour deposition (PVD) rivestimento. Fodera di canale richiesto per queste diapositive. Fodere di canale sono una stampa adatta e richiede uno strumento per installare.